A real-life pioneer adventure – and murder story – set in the Canadian wilderness is recounted in Lillian Ross’ action-packed novel. 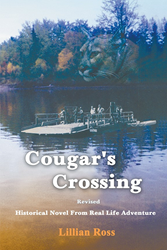 A real-life adventure – and murder story – is recounted in Lillian Ross’ action-packed "Cougar’s Crossing – Revised: Historical Novel from Real Life Adventure." The loud, brash, irreverent Cougar Wright who came from Wisconsin and the forests of Washington, swore like a trooper, and didn’t believe in a higher power than his own strength. But he loved his family and wanted them to join him in his struggle to tame the Canadian wilderness. His family’s dance with destiny in Alberta’s Northwest would shake his world and theirs, as it comes to life in this unforgettable tale with a mysterious twist. His story is filled with romance, adventure, and even a ghost! About the Author: Lillian Ross earned a bachelor’s degree in education from the University of Alberta and taught for many years before retiring to pursue her writing. Her husband, Reg, and their two sons lived in Northwestern Alberta and worked in the oil fields. She and her husband played in a dance band. She now sings and plays guitar with a women’s band called The Hinge. Her other historical novels are "The Gentle Gamblers," "The Tender Years," "A Full House," "Mewassin: The Good Land," "Gandy Dancer," and "I Kept Falling in the Sink." http://sbprabooks.com/LillianRoss or at Amazon.com or Barnesandnoble.com.